They say that when one door closes, another door opens, and finally, Chef Damien Watel has opened the doors to his latest and most anticipated, venture yet. Bistr09 is now serving “le diner” at its new location in Alamo Heights, on Broadway. 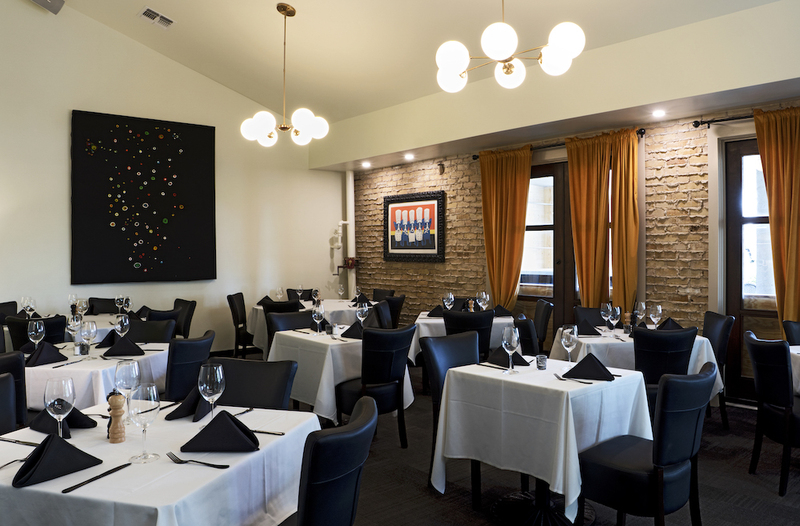 Taking over the old restaurant space that previously housed L’Etoile many years ago, Chef Watel re-emerges with a bright, open and airy concept that welcomes guests with one-of-a-kind artwork, painted by the chef himself. 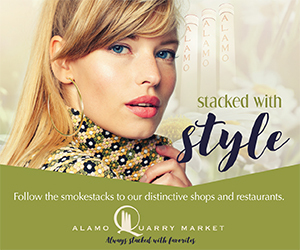 The restaurant features a clean and modern take on the French cuisine that Damien has been treating San Antonio foodies to for over 20 years, and he is already winning over new fans, while successfully appeasing his loyal followers. For now, Bistr09 is only open for dinner. 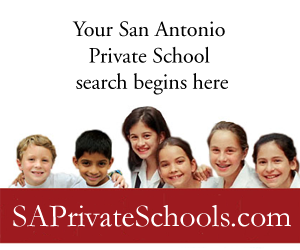 They will begin serving Sunday brunch in mid-April, and you can arrange group lunch events, as long as your group agrees to use shared ride transportation instead of parking at the restaurant. The center that surrounds the restaurant is home to several businesses that fill up the parking lot during regular weekday business hours, so the restaurant has agreed to respect this, since it is the new kid on the block, so to speak. The menu is reminiscent of Chef Watel’s menu at his former Olmos Park restaurant, Bistro Vatel, but it also offers a few more casual items like pizza and fried chicken. Many of the chefs most beloved dishes are still on the menu, however, so you will still find his famous Duck Confit and Dover Sole Meunière if you need an old-school Watel fix. 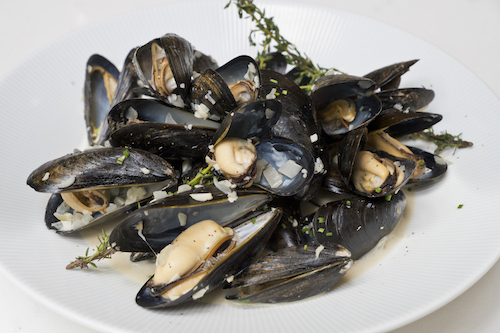 Among the other menu standouts, diners will swoon over the Steamed Mussels Lilloise. Damien was born and raised in Lille, a bustling city in northern France, just below the Belgian border. He attended cooking school in Paris before an uncle persuaded him to move to Texas and take the helm at one of his Dallas restaurants. The mussels, flown in from the East Coast, were incredibly fresh and bathed in a delicious broth of white wine, shallots, garlic, and thyme, with just a dash of fresh cream. You’ll definitely need a basket of French bread to go with this dish, as you won’t want to leave even one drop in the bowl, once you’ve emptied every shell. You will find quite a diverse choice of entrées on the menu at Bistr09, which will require many visits to the restaurant in order to understand just how talented Chef Watel truly is. On a recent visit, we sampled the Poulet Roti Au Jus, and it was outstanding. 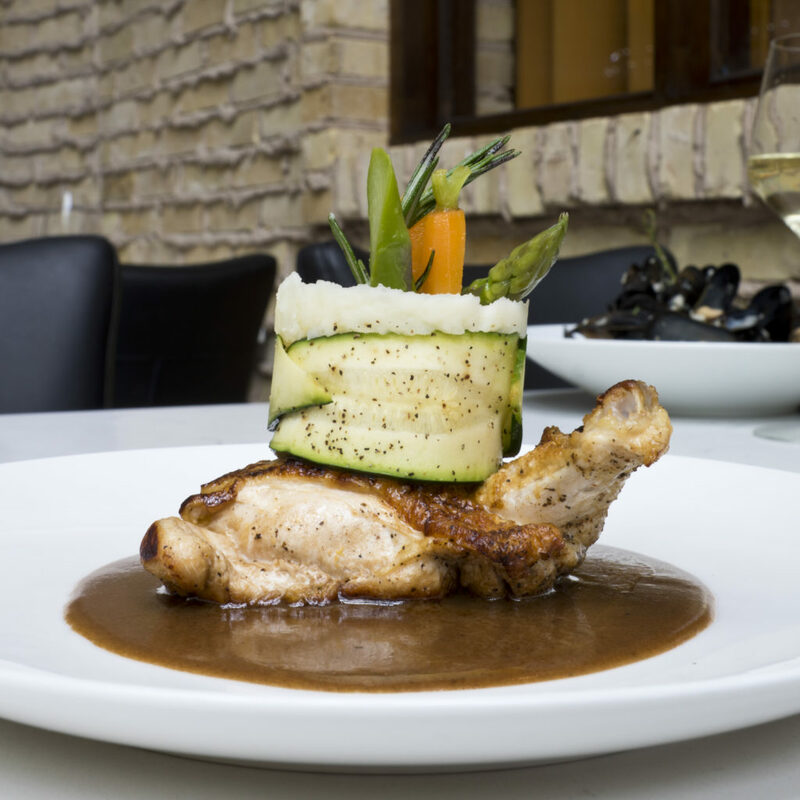 This delicately roasted chicken featuring an intense flavor that will make you savor every bite, and it is served beautifully with a timbale of mashed potatoes wrapped in a zucchini sleeve. The dish is served atop an au jus of the most perfect consistency I’ve ever seen. It was flavorful and smooth, complementing the chicken perfectly. Another favorite is the Lobster Risotto. 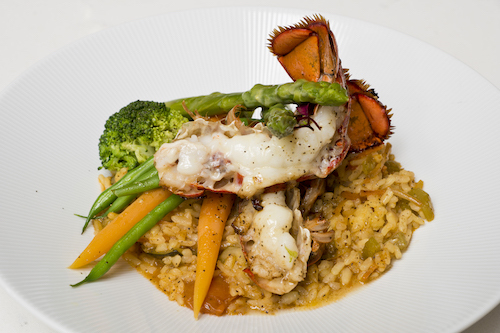 The delicate lobster tails are seared and seasoned, served atop a flavorful risotto simmered in fish stock with steamed asparagus, carrots, and haricots verts. The risotto has so much flavor that it is hard to discern every nuance involved in the slow cooking process, but it all comes together amazingly to create a very memorable dish. 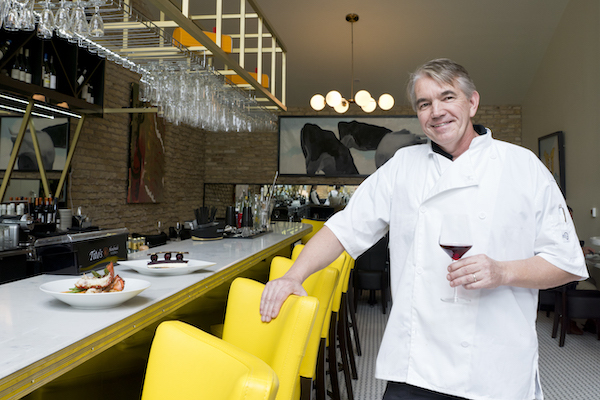 Chef Watel has called San Antonio home for 25 years now, and he collaborates on the menu at Bistr09 with his equally talented wife, Chef Lisa Astorga Watel. Chef Lisa runs Bite in Southtown, and together, they are a culinary force to be reckoned with. Talent obviously runs in the Astorga family as well, for the pastry chef at Bistr09 is Lisa and Damien’s niece, Andrea Astorga. Andrea learned the art of pastry and dessert in Mexico City and creates the most magnificent desserts for the restaurant. Do not miss her take on Blueberry Cheesecake. It is a deconstructed masterpiece that leans more toward art than food. 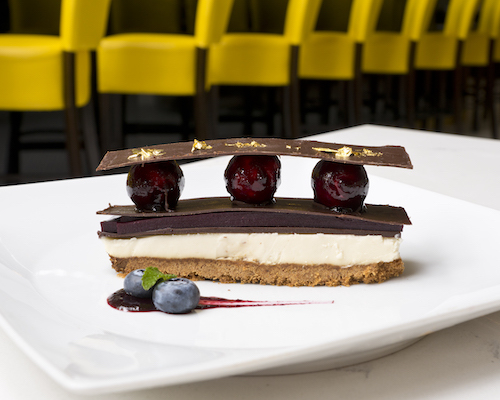 This dessert is a decadent symphony of layers, including white chocolate and lemon cheesecake, with a layer of blueberry gelée and dark chocolate, separated by three white chocolate spheres filled with cheesecake and dipped in blueberry sauce. It is topped with edible gold leaf accents and complemented with a schmear of fresh blueberry purée. It is almost too beautiful to eat, and you will feel guilty for destroying it, at least for a second or two. The phrase, “worth the wait,” most definitely applies to the road that it took for Chef Watel and his crew to get to completion with Bistr09, but now that it has arrived, you can bet that there will be nothing but success in their future. Bistr09 is Damien Watel’s ninth restaurant venture, and now that it has arrived in the “09”, diners can safely anticipate a long life on the banks of Broadway. Bon Appetit! 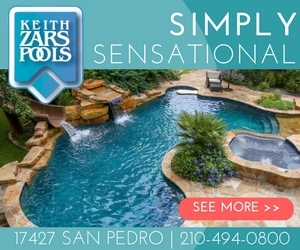 Half Texan on her mama’s side, Meredith grew up in Southern California and graduated from Pepperdine University, with a degree in Advertising. This allowed her to use words creatively, and to find her voice as a writer. She is a food enthusiast, and will eat anything but broccoli. 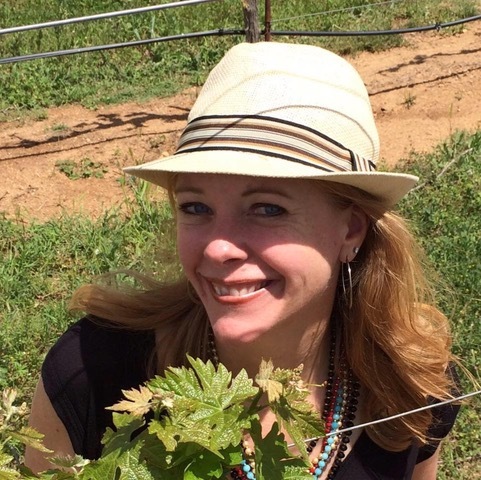 Meredith has an incurable case of wanderlust, and she loves to cook, travel and eat. She spends her days raising two kids, and rescuing as many dogs as possible. 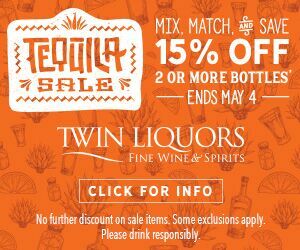 She wanders the streets of San Antonio, and the rest of the world when she can, searching for great restaurants, tasty cocktails and interesting people. She is also still waiting for Shiner Bock to make her their official spokesperson.